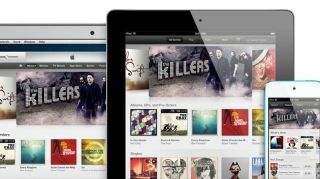 Apple low-balls music labels over streaming royalties? The battle for streaming music supremacy wages on by the minute, but Apple may have stymied its hopes of being a serious competitor thanks to its proposed royalty rates. A new report from the New York Post indicates the recording industry is pretty unhappy with rates Apple's has put forward on a still unconfirmed streaming music service. Music industry insiders speaking to the Post revealed the Copyright Royalty Board has a set rate for non-broadcast companies (those that don't own a radio station) of 21 cents per 100 songs streamed. Apple's initial offer is reportedly an insultingly low 6 cents per 100 songs streamed, or three and a half times less than what the board deemed a fair deal. Apple's cheap take may leave the company on the outside looking in if and when it tries to get its rumored streaming service of the ground. Pandora, which offers its basic service for free, currently pays double what Apple is offering, while Spotify pays almost six times as much (35 cents/100 songs) for its subscription service. Even though Apple's service is believed to be different than the on-demand services provided by the competition, the record industry has so far balked at the low-ball offer. With more competitive services like Beats and a possible YouTube offering bumping up against a quickly crowding market, it would appear the record industry has the advantage at the bargaining table. Another source told the Post that counteroffers are being prepared, so it's not like any of the players have walked away in spite of the dramatic entry offer from Apple. We'll see just how far the record industry's biggest guns like Sony/ATV, Universal, and Warner are willing to bend to accommodate Apple.